Yay for Saturday! How are you enjoying the series so far? When it came time for me to pick my China Glaze (because you know I had to use a China Glaze!)... let's just say I had way too many reds and pinks to choose from. 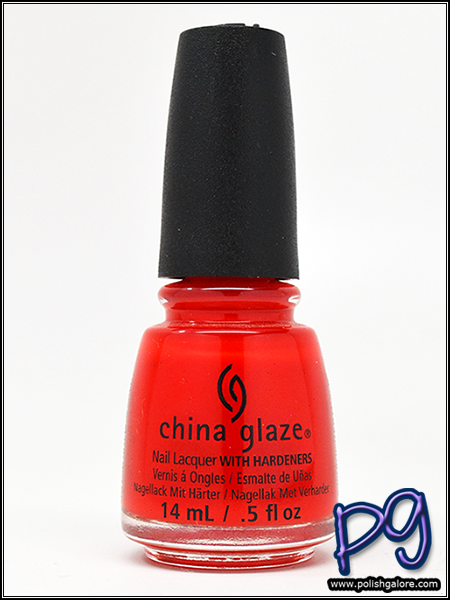 I mean yes, China Glaze does have a good rainbow of color but holy cow... so many reds! Today is The Heat Is On from the Summer 2015 Desert Escape collection. This was that weird collection that was only available in open stock at a website called Lock And Mane, nail kits were going to be at Sally's and Ulta was like "Nope, we aren't doing anything with this." I used a base of Duri Rejuvacote, 2 coats of polish and finished with Glisten & Glow H K Girl top coat. So The Heat Is On is this tomato red almost jelly like polish. I was really surprised by it at first. The formula was super thin and runny - I gave in and just flooded my cuticles so I could clean up later. Not my favorite formula, but when I really like a color, I'll deal with more time in clean up. You can see a bit of visible nail line on my middle finger so I may have needed 3 coats. Also my ring finger cuticle needs some serious attention. Right now I have oil on and I'm going to try and see my manicurist before the weekend's over because hey - we have another week of Valentine's to go through! But back to the polish. this is pretty but the formula makes me mad. I prefer more of a thick creme that can be applied in 2 thin coats versus a runny thin formula that needs 2-3 coats. This red also has a lot of orange in it, which isn't my favorite but it's still doable.